Arni Cheatham is being honored for raising jazz awareness in Boston and for his work with young people. “One of the things I like about this building is that when I practice, people don’t call the police — they open their doors.” Arni Cheatham is leading me up to the apartment he shares with his wife, the artist advocate Dottie Guild, in the Piano Factory building in the South End. The building — long a residential building for artists, where he has been actively involved in running the nonprofit art gallery — is as much a part of who he is as anything he does. Cheatham — longtime Boston jazz musician, photographer, educator, and also arts advocate — will be honored as a “Jazz Hero” as part of Jazz Week in Boston (April 26-May 5). His honor, presented by the Jazz Journalists Association and JazzBoston, will be celebrated in a party open to the public at South End jazz mecca Wally’s on Sunday. Cheatham, 68, is probably a name familiar mostly to Boston’s jazz insiders. 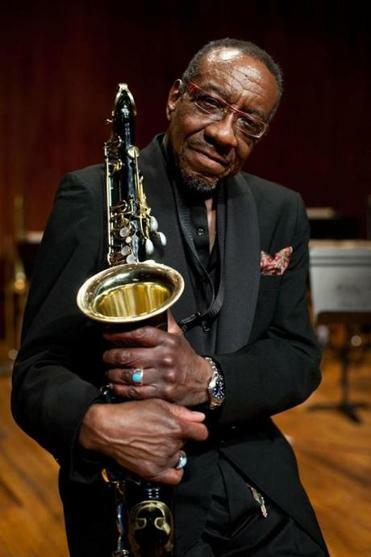 He has only a handful of recordings under his leadership and is best known for his work in the Boston avant-garde big band Aardvark (this year celebrating its 40th anniversary) and, more recently, in the Makanda Project (a band dedicated to the music of another undersung Boston jazz hero, the late Makanda Ken McIntyre). But Cheatham’s influence in the jazz scene — and beyond — is wider and deeper than most people are probably aware. He was a founding member and prime mover of advocacy group the Jazz Coalition in the ’70s and early ’80s. That group not only aimed to raise Boston’s jazz profile, but also did its own share of community works — developing music education programs that helped heal the wounds of desegregation and bringing music to hospitals, homeless shelters, prisons, old-age homes, and other underserved communities. That group was a precursor to the current JazzBoston (organizers of Jazz Week), where again Cheatham is an active member and is running another education program, Riffs & Raps. Jazz Coalition founder and Aardvark leader Mark Harvey, who nominated Cheatham for the Jazz Hero award, remembers his friend’s work from those early days. “Arni took the lead and devised the whole program. He did all the major work of writing grant proposals and making sure they got to the correct offices. A big nonprofit has a couple of floors of people dedicated to doing what Arni did on his own.” Those duties also included contending with a notoriously fractious Boston School Committee. Cheatham’s own playing has, as you might expect, a profound sense of the group endeavor. On Aardvark’s latest CD, “Evocations” (Leo Records), he’s featured on “Sumner” (named for the Massachusetts senator and abolitionist Charles Sumner). Though it’s a tumultuous piece, Cheatham’s tenor solo builds with calm determination and a sense of organic development, in a clear dramatic arc. It ranges freely while simultaneously taking in the shape of the composition, climaxing in a frenzied “battle” with Lowe’s trombone. Talking about his ’70s jazz-rock outfit Thing, whose “compositions” were mostly spontaneously improvised, Cheatham recalls, “I told everybody: Our job is to support one another. So if somebody has an idea, everybody should coalesce underneath and support that idea. If you have an idea, bubble it up to the top and we’ll get underneath it and support it. That’s how the music is going to be structured.” It’s easy to see Cheatham’s musical philosophy as an embodiment of his life philosophy. Just another reason so many in the Boston jazz community consider him a hero. The Arni Cheatham celebration at Wally’s is just one of many events scheduled for Jazz Week, many of them free. On Friday, there will be noontime Kickoff Concerts by New England Conservatory student ensembles at Downtown Crossing, South Station, the Boston Public Library Courtyard, and the Harvard Square T station. Monday through Friday, April 29-May 3, Piano Solos by Boston Favorites will take place at South Station, with performances by, respectively, Tim Ray, Maxim Lubarsky, Yoko Miwa, John Funkhouser, and Gilson Schachnik. Jazz Week @ the Boston Public Library will include saxophonist Tom Hall leading “Improvise Your Life” on April 29 from 6 to 7:30 p.m. — an “interactive workshop for non-musicians guaranteed to raise awareness of the improvisational possibilities of each moment.” And, among the bigger-deal concerts of the week is BGJI (Berklee Global Jazz Initiative) Jazz Summit on April 29 at 8:15 p.m. with Brian Blade leading an ensemble that will include Danilo Peréz, Joe Lovano, and John Patitucci. For more details on all Jazz Week events, go to www.jazzboston.org.